Ireland is emerging as a progressive, inclusive nation, but we have a long way to go yet, writes Laura Harmon. I can only imagine what it must feel like to have cast your first yes vote in the marriage equality referendum in 2015 at the end of your first year in college, and to then go on to cast another yes vote in your final year on removing the eighth amendment. Two major societal changes have taken place by referendum within one four-year college degree cycle – two major victories that mean that eventually those growing up in Ireland don’t have to feel ashamed about who they love or whether they need to access the reproductive healthcare they need. Both yes campaigns were against sexual oppression, against stigma and shame, against societal pressure to keep secrets that could eat a person up from the inside out. Two referendums: two steps forward and a collective affirmation that we’re never going back. Students’ unions have been a hotbed of activism and creativity during this period. 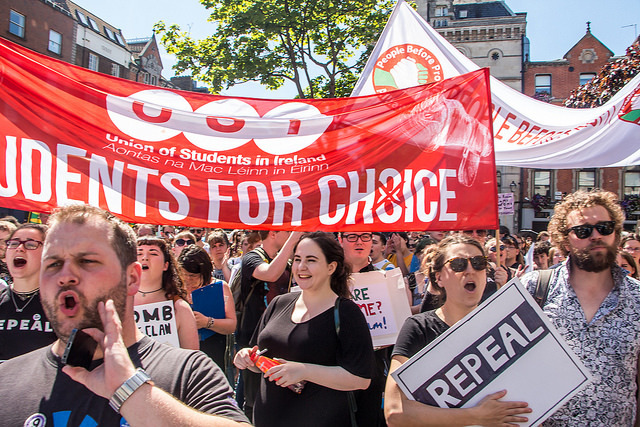 Between 2014 and 2018, the Union of Students in Ireland (USI) directly registered nearly 80,000 students to vote – over four times the total student population of Trinity. This figure specifically refers to registration forms that are directly posted off to local authorities on behalf of students and doesn’t include the tens of thousands of more students who post off their own forms following the information campaigns of students’ unions. Students’ unions are doing a great service to democracy in Ireland and to those they represent by enfranchising so many citizens, year in, year out. But the task of running voter registration campaigns shouldn’t always fall on the shoulders of unions and other civil society organisations. Voter registration needs to become automatic when a citizen reaches voting age and the government needs to create an Electoral Reform Commission tasked with overseeing targeted campaigns in this area as part of its remit. It seems that in recent years, this country’s dark past is coming to light and that as a nation we are starting to become conscious of the damage that was done – the Magdalene Laundries, the mother and baby homes (the last of which only closed in 1996), the abuse that occurred in industrial schools and the harm caused by the institution of the Catholic church that was allowed to go on in that architecture of coercive confinement. We saw from the reactions and protests coinciding with the Pope’s visit to Ireland that it’s clear that the grip that the Catholic Church had on this country is not nearly as tight as it was the last time a Pope visited Ireland in 1979. It’s time to remove religious control completely from our education system and have a national conversation about school patronage in this country. We need to take a hard look at the present – the homelessness and housing crisis, the cost of education, the under-funded health service, the wealth gap in our society. Many of these inequalities are a result of successive government policy decisions, a failure to collect higher taxes from the wealthiest and a refusal to demand meaningful contributions from big corporations to go towards looking after the communities they base themselves in. The frequent passing of the buck from one government to another has in many cases resulted in a lack of long-term planning. And what about Ireland’s inhumane direct provision centres? The benefit of hindsight or the excuse that we didn’t know what was happening right here in the present does not apply here. We know that this is happening – we know that people are being detained, that they are not allowed to work, that they receive an allowance of just €19.10 per week, that they cannot afford to go to college, that they aren’t allowed to cook their own meals. What does this say about us as a nation? Direct provision needs to end. It’s been heartening and inspiring to see so many of the campaigners who were involved in local Together for Yes groups now getting involved in other campaigns like ending direct provision and homelessness and the prominent role that students are playing in these campaigns. Ireland is well and truly waking up and there is a generation of seasoned, young campaigners who have been part of successful campaigns in recent years and have seen first hand that grassroots activism works. Students’ unions continue to be central to campaigning for a better, fairer Ireland. For many campaigners on social justice issues, the last few years have been a rollercoaster. It might be an attractive option for some to rest on one’s laurels but now more than ever, it seems that further change is possible and there is a responsibility to keep pushing for that change. Ireland is emerging as a progressive, modern, inclusive nation. The key word there being “emerging” – we have a long way to go yet. Laura Harmon is a former president of the USI and the Mobilisation Team Lead for the Together for Yes campaign.